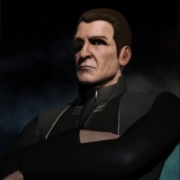 Kurrius is a current EVE University Personnel Officer. He lives in the North American East timezone, in Quebec, Canada. He's a native french speaker, but can also speak english when he's not too drunk. When drunk, some say that his english sounds like an old japanese dialect. Kurrius joined EVE online on June 4th 2013, and managed to get himself into the E-Uni on July 6th 2013, interviewed by his now colleague from the PO department, Jameson Bolmara. At some point, Kurrius decided that he should be carebearing in style, joining the Personnel Officer department on November 14th 2013, since undocking is obviously overrated. At some point, he also decided to join the Low-Sec Campus to get a taste of a more dangerous lifestyle, and is currently planing to move into the Wormhole Campus in the near future. When bored or in need of Iskies, Kurrius is a regular Incursions runner, and can sometimes be seen running L4 missions. His favorite cookie flavor is macadamia nuts. He sat in his first Battleship about 3 weeks into his Eve life, before learning that bigger is not always better. The Battleship survived, somehow. When drunk, he has the bad habit of shooting his fleetmates if they become flashy, because a flashy is a flashy. Be aware. This page was last modified on 11 January 2017, at 05:48.